If you don't already have a directory on your computer that is specific for external plugins for chimera, create one called 'Plugins' wherever you want. If you haven't downloaded the plugin, do it here. Uncompress the file in the 'Plugins' directory. In Chimera, go to Favorites → Preferences, from Category select Tools and add the 'Plugins' directory containing the ADP EM folder to the Locations. 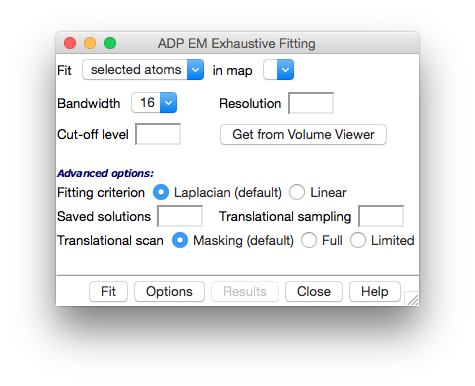 The ADP EM module will be under the Tools → EM Fitting menu. In the first row, you could choose you atomic structures and your maps loaded in Chimera. Bandwidth: corresponds to the bandwidth in the harmonic transformation. Its values are set to 16, 24, 32, 48 or 64. - if a Pdb file is fitted → nominal resolution of the projection map in Å. - If a 3d map is fitted → density threshold value for the fitted map. Cut-off: is the density threshold value for the experimental map. All density levels below this value will be not considered. 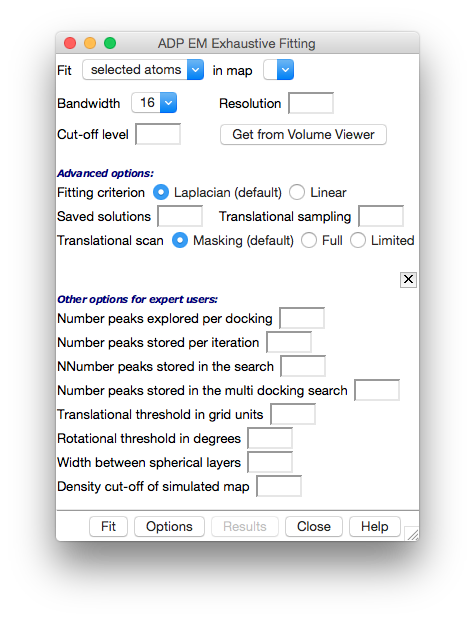 You can get this value from the level parameter showed in the Volume Viewer to adjust with more precision your map density. - Standard linear cross-correlation → the scalar product between the density maps of the low resolution map and the low-pass filtered atomic structure. Recommended for resolutions < 15Å and when the atomic model accounts all the density of the map. - Laplacian filter → is applied by default (as told in 2.2) to maximize the fitting contrast. Recommended for resolutions > 15Å and when the atomic model only accounts a part of the density of the experimental map. Saved solutions: number of the saved solutions that ADP EM will compute (50 by default). Translational sampling: in Å, by default twice of voxel size of the density map. Values > 6Å should not be used. - Full search → all the translational points inside the target EM map will be explored. - Limited → radial search starting from the center of mass. - Masking search → default (as told in 2.2). Number peaks explored per docking: default 30. Number peaks stored per iteration: default 20. Number peaks stored in the search: default 100. Number peaks stored in the multi-docking search: default 500. Translational threshold in grid units: default 2.0. Rotational threshold in degrees: default 360/bandwidth. Width between spherical layers: default 1.0. Once you have inserted the parameters you want for the adjustment, simply click Fit and enjoy. You will see the process log in a new window and, when it is finished, you could check the results in the correspondet panel. The plugin was developed by Pablo Solar for Pablo Chacón's group (chaconlab). Acknowledgements go to Pablo Chacón and José Ramón López Blanco, CSIC, for sharing their time with me, wisdom and friendliness, and to Tom Goddard, UCSF, for providing useful insights.